Packed up the Religion, Self-Help, Politics, History, & Rare books. Late nights packing catching up with us, opened late this morning. Hubbell & David were here. LDD Wonderland Limited 1st Edition books on order. Then went to see the new Alice in Wonderland movie. 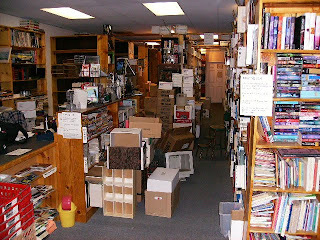 We packed up more History, more Cookbooks, and some of the Romance. Printed more We're Moving flyers/coupons. We're out of boxes, but more are coming tomorrow. Which number through the magic of Google will ring the old shop until we have moved over. It isn't a great vanity number but it was the best we could find in the 562 area code. 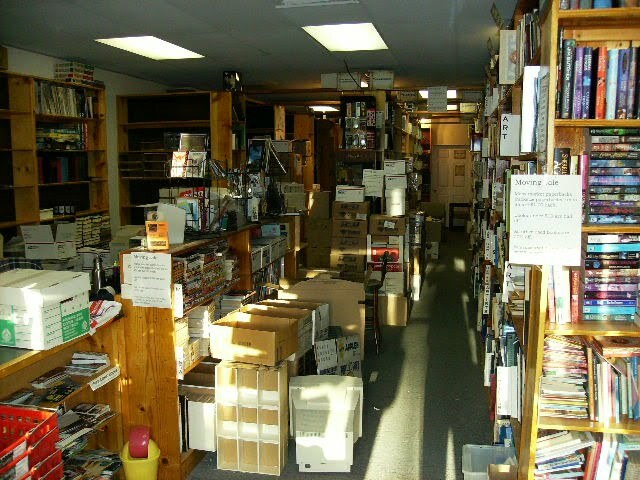 Packed up Sports, European History, about half the Cookbooks, and some of the comics today. Only David was here again. Looks (and smells) like the monitor on the 2nd computer system burnt out. 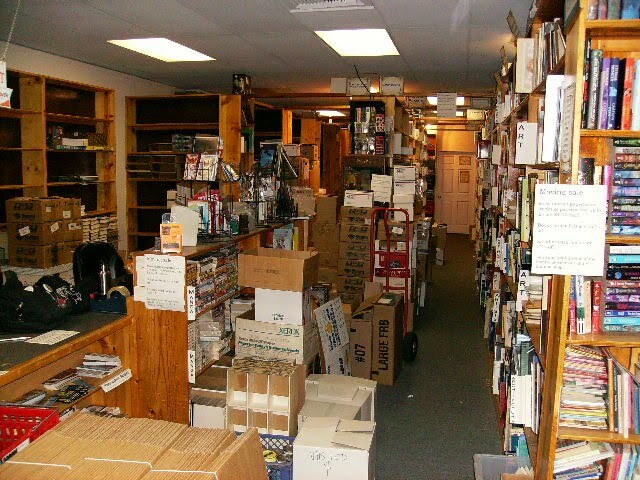 We've packed up the Ancient History, Movies, Erotica, Gardening, most of the Toys, much of the rare books, and Magazines. Everything else is still available for the next few days. David was here, but no one else. Hubbell & David were back again. Tubs of toys were packed, the National Geographics were packed. Paid bills, added google analytics. 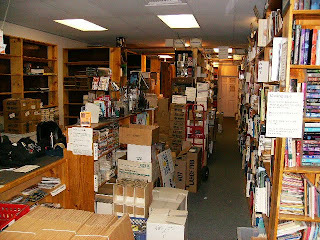 Unboxing of boxes, and packing of books. A fair amount boxed up, but still have paperwork to catch up on. Bah didn't get anything done today, spent the day trying to get services and things set up in the new store. David was here, a few more boxes packed. Started early with Hubbell opening the store, we went to get the truck from the storage place with David. Had the truck filled with boxes by around 2:00, and emptied by around 5:00. Well the paperback show was fun, but we didn't do so well. We did pass out a lot of flyers & tell people about the move, and we did get a fair amount of books signed, so overall perhaps we should call it a wash. The new packing formula is speeding things up a bit. We finished getting ready for the Mission Hills paperback show 2010. The Moving Sale is doing fairly well at clearing out some paperbacks. We're getting some things packed up, but it's slow going. 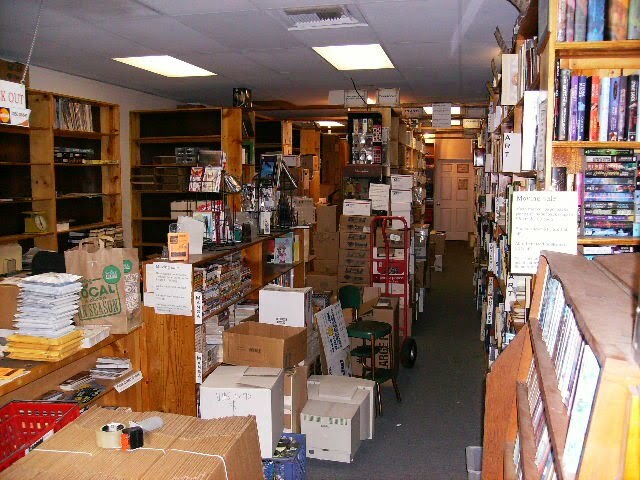 We're also getting ready for the Mission Hills Paperback show this Sunday. Took a suv-full of boxes to the garage. Now we're off to take another suv-full of boxes to the garage, then go measure up the new location more. It might be St. Pat's but for us it was Boxing day. David & Hubbell took boxes of books to storage. Printed new coupons / we're moving flyer's. We began boxing up books. And it should be open sometime in April 2010. We'll keep you posted. Since we don't want to haul everything across town, we're having a moving sale. 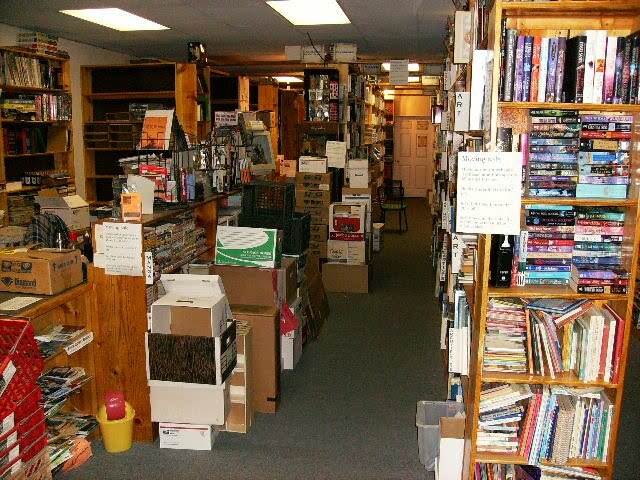 Mass market paperbacks (racksize paperbacks) are $1.00 each. Books under $10 are half off. 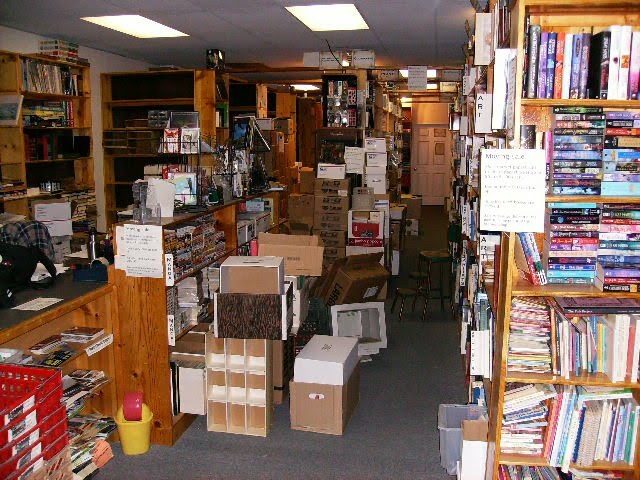 All other used books are 20% off. Sale runs until the end of the month, or we're out of the Stanton shop. Exclusions apply, see store for details. Buying & Trading hiatus - until we're moved we will not be doing any purchasing or trading. We will still take donations. Both David & Hubbell were here, refuting the rumour that they were the same personage in different outfits. Took a load of boxes to storage. We had 2 new tires put on the A Castle of Books-mobile to get ready for the paperback show in mission hills this Sunday. Super important announcement tomorrow, about our mysterious doings lately - don't miss it! The time change messed us up as usual and we were slightly late opening. We were here, but just didn't get the carts out front soon enough. Nearly didn't close on time, but that's much less of a problem. Started boxing up extra stuff. Bah, late renewal of DMV registration meant double the fees. Touched up more Facebook/blogger settings. Shelved the entire new comics/Manga shipment. Emailed in the secret forms. Bestsellers of the day = Fiction closely closing out the poetry. Purchased a stack of Medical & Religious books. Huge load of NEW Graphic Novels, Manga, and toys arrived today, 10 boxes from Diamond. More running around and looking at stuff. Spent several hours messing about with various social networking sites, cross linking our website, blog, facebook page, and twitter accounts. Made a bunch of call and found out info, some rates and sizes. Bestsellers of the day = general fiction. Purchased a large box of CD's and already shelved a good stack of them at only $1.00. Almost finished packing the online orders but ran out of tape, best finish quickly tomorrow morning. Ran off looking at stuff again. Bestsellers of the day = Charlie Brown. David was here but not much was done for all the jabbering. Started to incrementally inventory everything - started with some Entertainment paperbacks. Sorted & cleared out the front isle again. Bestsellers of the day = language reference books. Shelved 4 boxes of New Discount Manga. Processed a few stacks of minor collectable books. Purchased a small stack of books. Bestsellers of the day = Medical books. Purchased a few science and philosophy books. Shelved 5 or 6 sets of Shojo Manga. Commiserated with Bain about the outrageous new eBay store fee increases. Checked and found that maybe the 5 cent listing special for books with ISBN's will still apply until December, so spent the day trying to figure out what of our listings use that. 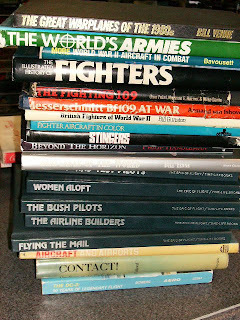 Shelved a large stack of non-fiction, travel, history, military, etc. Messed with social networking sites a bit. Processed a small stack of minor collectable books. Updated our yelp page, added some photos and info.